In *some* beekeeping practices beekeepers are taught to clip the wings of the queen. This is done to prevent queens (mothers) from swarming (reproducing). When you cut off her ability to fly far, you cut off her ability to bee who and what she is. To clarify, she can begin to swarm, but often falls short or gets left behind and the swarm has to return to the hive. When you clip her wings, you take her birthright away from her. And by her, I don’t just mean the queen, I mean Her, the colony. 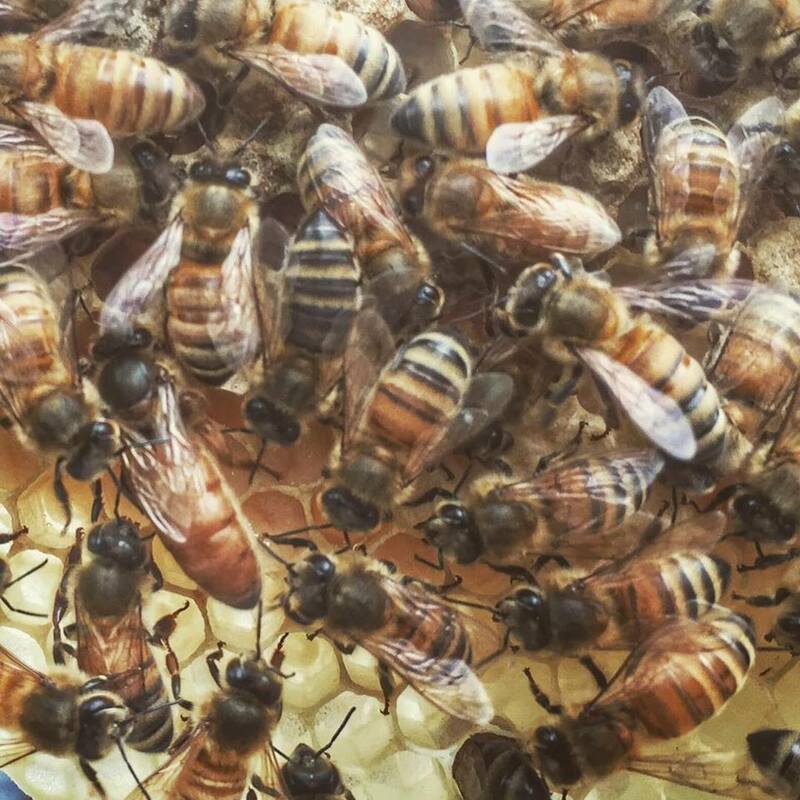 The queen bees needs to be able to fly once a year. Every spring she leaves the colony in a swarm of bees, landing on a nearby tree branch or post and waiting while her daughters scout a new home. In this way, she leaves behind a thriving hive with their virgin queen, and starts a new hive, thus reproducing on a colony level. The superorganism gives birth to itself. The female body and the body of the earth and her creatures has been seen as an object for thousands of years. There is a direct line of connection in the human psyche between the body of the earth and the body of a woman. Both were/are seen as wild, unsafe, monstrous and necessarily needing to be conquered and tamed by Patriarchy. There is a reason we call the planet Mother Earth. All life comes from woman. This is not man shaming. This is woman claiming her birthright to freedom. Earth and woman have suffered for their existence. Both have been suppressed, oppressed, mutilated, studied, dissected, rejected, obsessed over and violated. Even on this platform we are not permitted to express our nature to its fullest without shame, harassment and censorship. People get angry at me when I equate feminism with bees. When I draw connection between the body of a queen mother and the body of a woman. I say take your blinders off and look at what we do to our bodies in the name of profit. Clipped wings equals no swarming and better honey yields for humans while the mother and her daughter suffer. Clipped reproductive rights for half the human species mean what? So you want to keep bees, but aren’t quite sure where to start? When I decided to become a beekeeper, I had just barely managed to squeeze a weekend class and some dedicated YouTubing under my belt before I received an unexpected swarm call and my new life began. Catching my first swarm was exhilarating, intimidating and required a lot of patients. I made some mistakes, but the bees ended up safely settled into their new top bar hive, and I, beaming, fell utterly in love. My dream of the apiary exist at the Natural Beekeeping Trust. A place of serenity and joy, filled with the life-affirming site of flowers, colorful hives and humming bees. On an brilliant autumn day in September, the sky is clear and the sunshine awakens hives to a prosperous day of foraging. Melissa bends low and plucks a small herb growing out of the cobble stones in front of her house. She holds it up to the light and shows me the tiny perforated holes in the leaves.